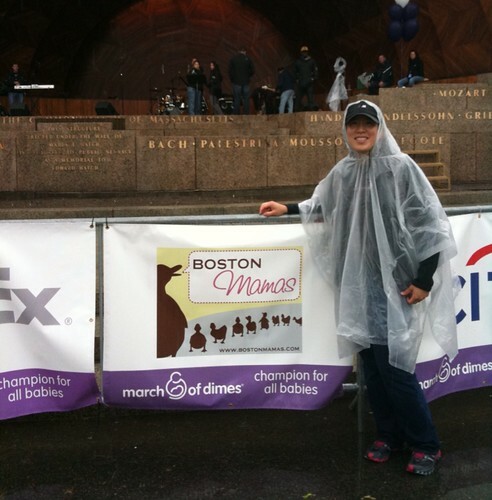 Last Saturday, I ventured out in the rain with Christine of Boston Mamas, Christina of Fairly Odd Mother and their kiddos to walk in the March for Babies. I was very pleased to raise more money than my goal. It's not too late if you would still like to donate! Just click the banner above. The weather was dismal. I thought I came prepared wearing my Disney World poncho, but one step into a puddle and my feet were soaking wet for the day. 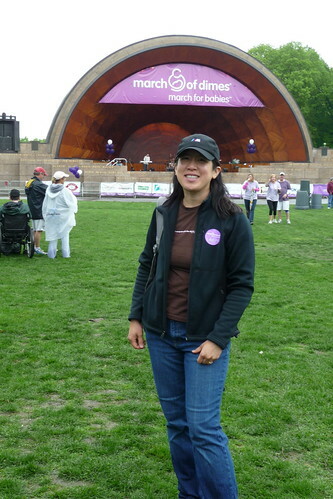 We started out at the Hatch Shell where the Boston Pops performs on the Esplanade in Boston. 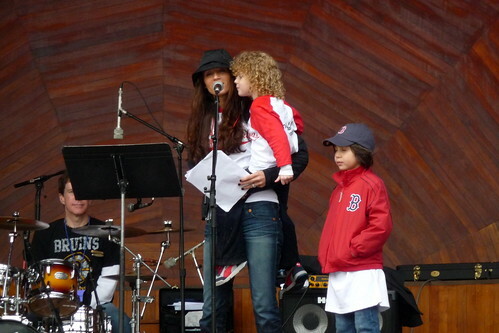 Enza Youkilis, wife of Red Sox Kevin Youkilis, spoke with her charming son Michael, who was born prematurely at 29 weeks. 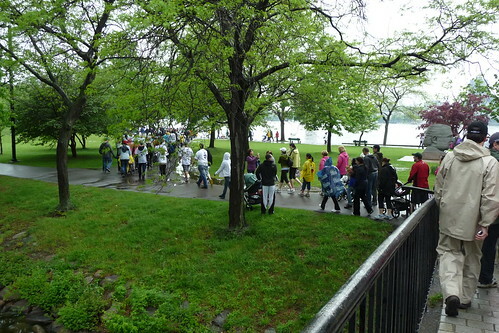 As the walk started, the rain let up. Here's the bridge to the Arthur Fiedler statue. We walked down the Esplanade across the river from MIT. 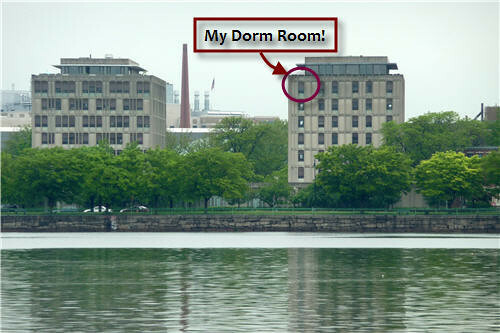 I got a photo McCormick Hall where I had an awesome dorm room with a view. At the end of the walk, I finally took off my poncho after checking the weather radar on my iPhone. It turned out to be a fine day! Since I rarely get to Boston without the family, I decided to park at Alewife in Cambridge and take the T (subway) into Boston. I hadn't realized that parking had gone up to $7, or else I would've just tried to find parking in town. The T fare was also up to $1.70! But without that, I wouldn't have run into this character who looked like a cross between Jason Lee and Ryan Gosling. 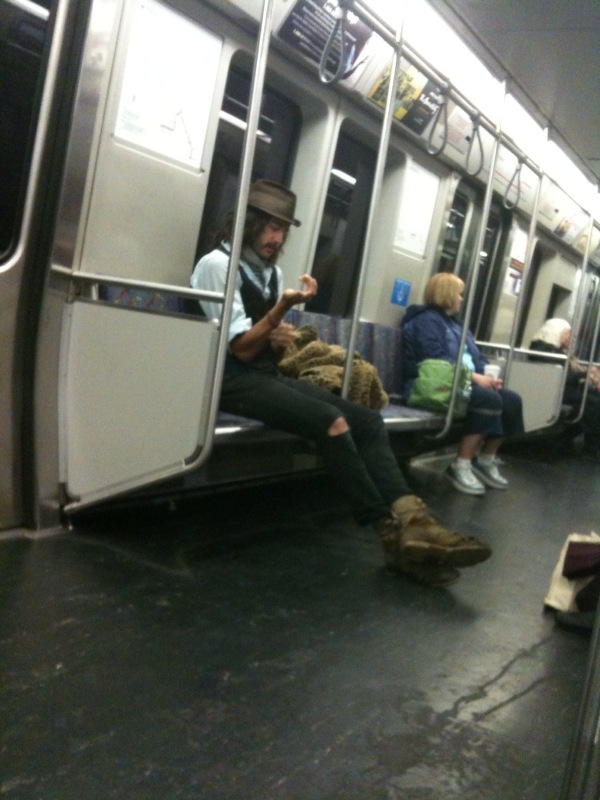 Hooray for people watching on public transportation! Please consider donating to my Relay for Life team as well. Congrats on surpassing your fund-raising goal! That's awesome. And, your persistence for doing it in the rain with wet shoes! I'm sure you had a great time, even in the rain! I have great admiration for what you've done here. We do the Relay for Life here in the summer (my wife and my mother-in-law are cancer survivors).